« Reintroduction of the Eurasian Lynx into England given the boot by Defra. The buzzard was found dead, with a missing foot, on March 14. The hobby — a small falcon similar to a kestrel – was found alive, also with its foot missing, on September 23. It was taken to the RSPCA and put down. The dead Buzzard with the right severed leg. “The birds, a hobby and a buzzard, were found with horrific injuries. Both had lost a foot as a result of becoming caught in a spring trap,” said a spokesperson. Jenny Shelton, from the RSPB’s investigations unit, said: “Spring traps are sometimes used to catch and kill vermin, and are legal if placed in a tunnel, with a restricted entrance, for this purpose. “However spring traps set out in the open are illegal, and pose a huge danger to wildlife. “We have had numerous reports over the years of birds of prey being deliberately caught in these brutal devices. “Birds of prey are incredible creatures and it’s devastating that the lives of these two birds have ended in this way. PC Tim Campany, from the Country Watch team, said: “We are working closely with our colleagues from the RSPB to establish what happened. One line of enquiry is that the birds may have been caught and held in a spring-type trap. 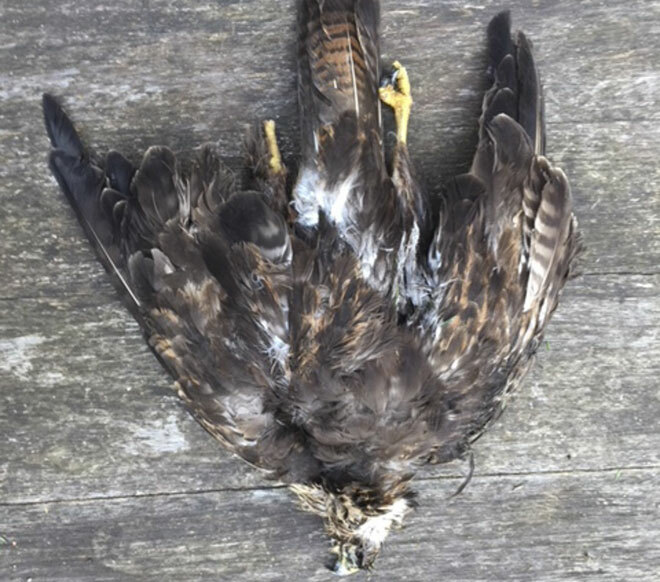 “Raptor persecution is a priority of the National Wildlife Crime Unit and will not be tolerated. for the proposed White-Tailed Eagle introduction to the island.